On one side of the gate is Jennifer and Jill’s tranquil back patio. On the other side is Rob and Daryn’s kid-friendly garden. Across the way, in the third-floor living room, a Julian Schnabel resides over the fireplace. 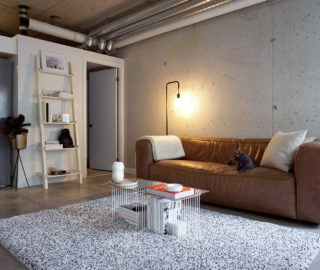 Wood/concrete cabinets from Made; rug, chair and floor lamps from DWR. Left: A graphic on the elevator door marks which floor (of four) we’re on. Rug from Made; painting by Oli Goldsmith. Right: Facing the backyard, Rob’s dining area is fitted with a tube light by Castor and chairs from DWR. 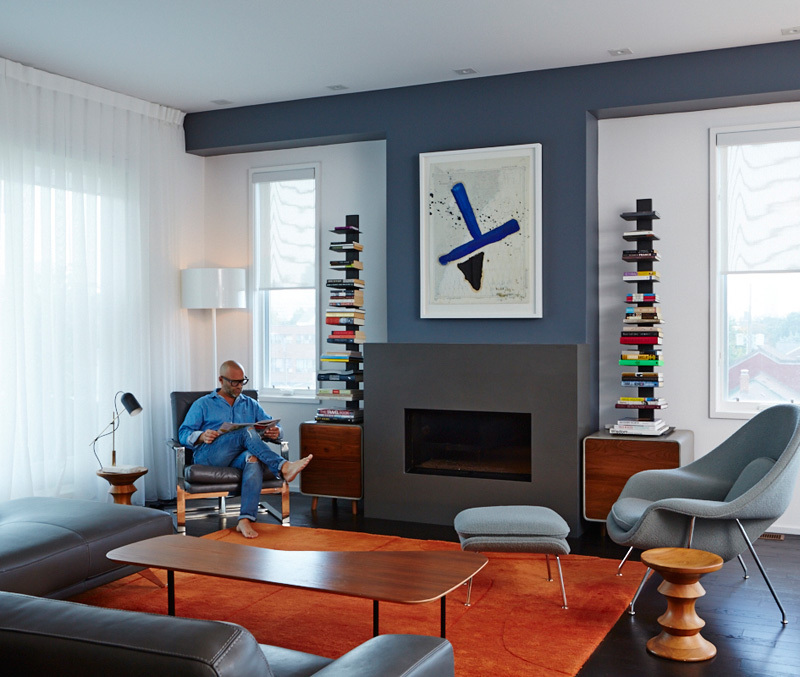 Left: Rob’s mucho-masculine office features a desk from Stylegarage; rug from Elte; photo by Finn O’Hara; and plenty of automobile memorabilia. 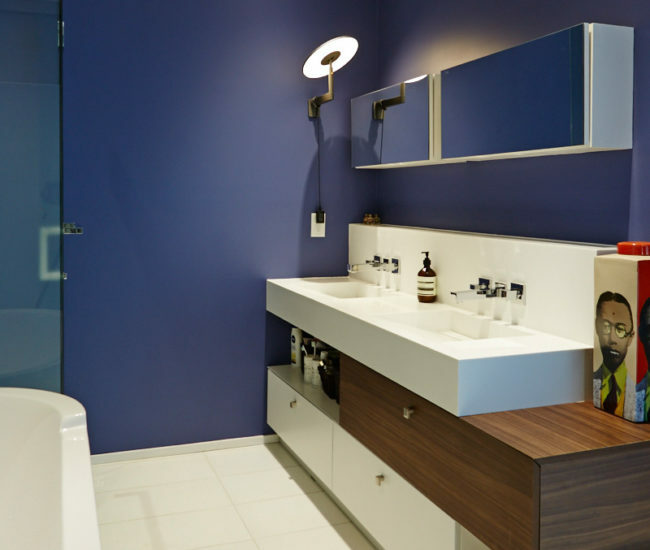 Rob’s master bath, right off the bedroom, is pretty much Jennifer’s twin, except he opted for blue walls rather than floor-to-ceiling tiles. Rob and Daryn’s front door leads past a foyer to a family room at the back. The tiny Eiffel chair was a gift from Jennifer. Mirror from Palazzetti; Eames coat racks from Ella+Elliot. Jennifer works at a concrete-topped dining table on a leather-covered booth overlooking the street. Millwork here extends through the kitchen to the living room at the back. Left: Millwork on the northern wall spans the first floor, reaching the natural-gas fireplace in the walk-out living room. Limestone surround by Ciot; Noguchi table and Nelson bench from DWR. 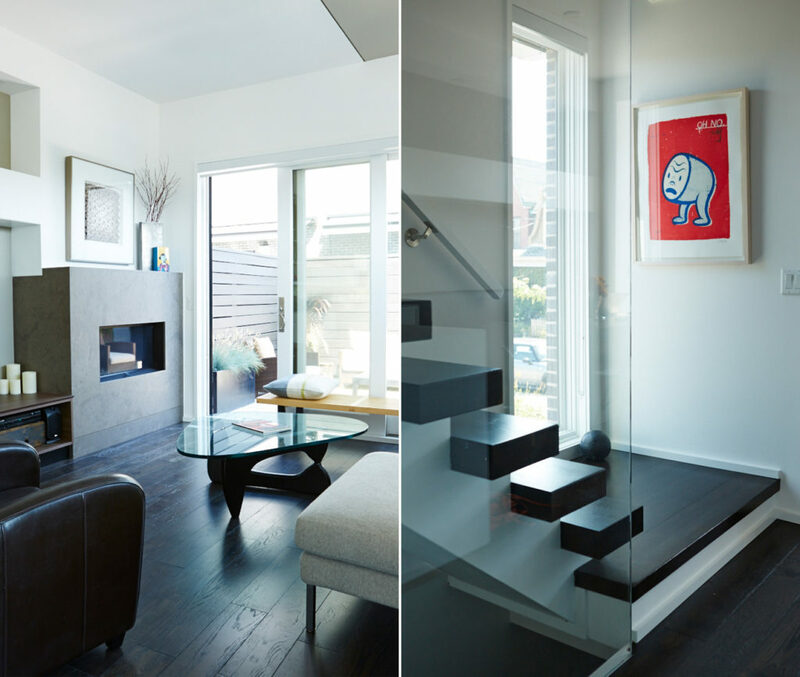 Right: Art on the landing by Gary Taxali. 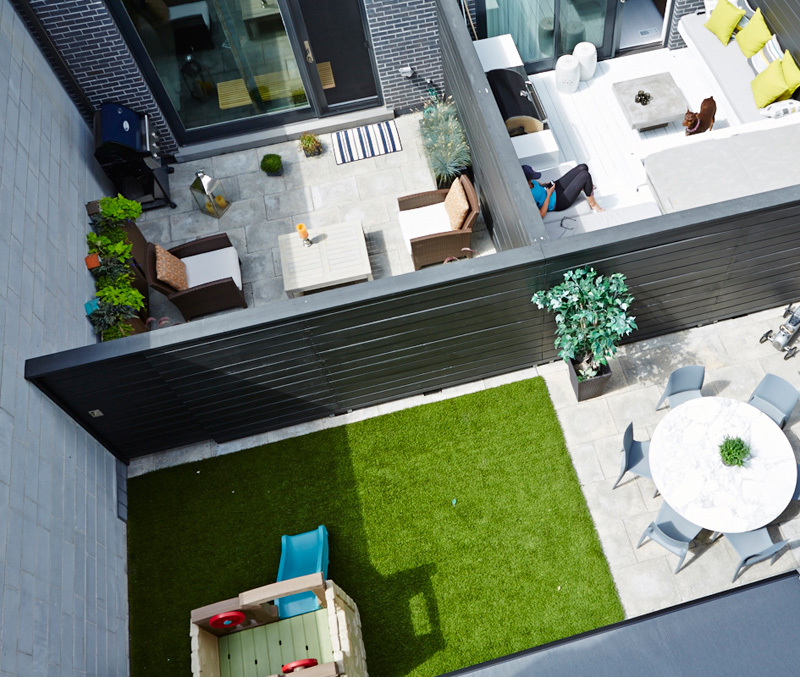 Up on the third floor, the master bedroom has a terrace big enough to seat two and a few plantings. Bed from Kiosk; art by Christine Flynn; pendant from Morba. 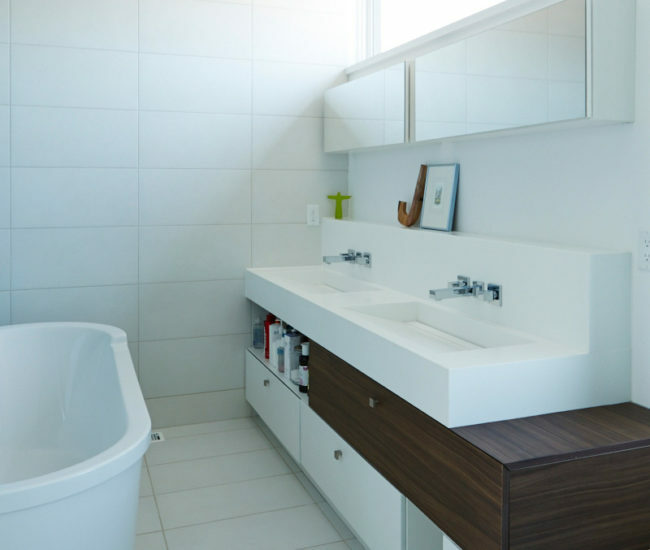 Both master baths salute Cecconi Simone’s design: linear, asymmetrical, serene. Custom Corian sinks; Philippe Starck soaker tubs; tile from Ciot. Jennifer opted for a high-contrast, dark wood grain–melamine cabinet front. Jennifer’s serene, white-on-white home office offers views of downtown. The custom desk is made of steel tubing and wood; the chairs are a vintage-store find. 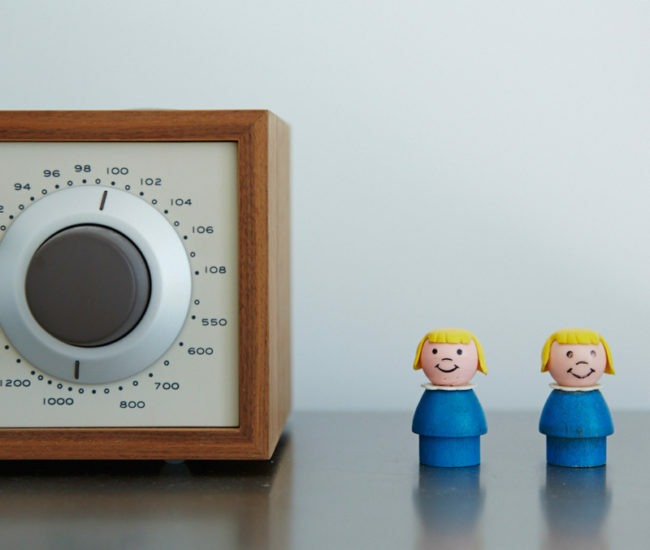 Vintage Fisher-Price Little People sit atop the bureau. Jennifer and Jill have a thing for Lego kits and vintage figurines – they’re dotted throughout their home. 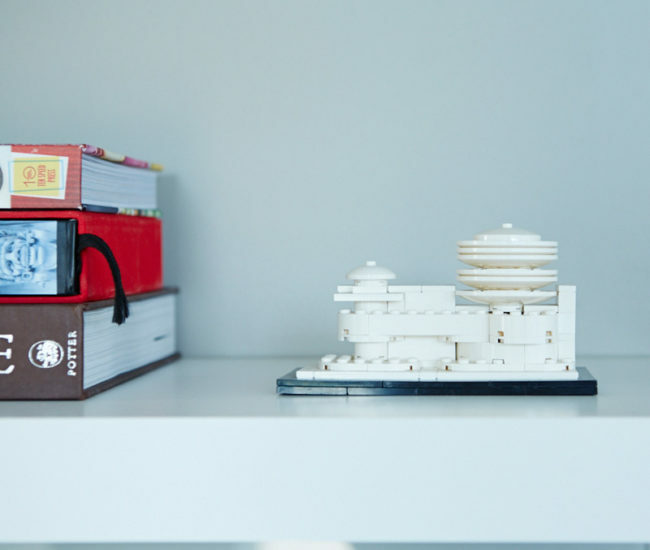 An architectural model of NYC’s Guggenheim holds court in the kitchen. “We’ve done pretty much every neighbourly thing except for borrow that proverbial cup of sugar,” says Jennifer of her long-time friend Rob and his family. 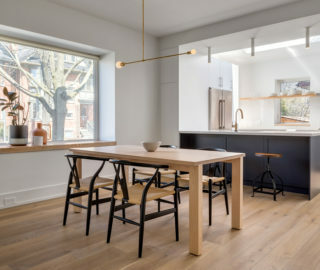 After a move back to Toronto from the U.S. in 2011, Jennifer, who is the general manager of a craft beer company, called Rob to discuss a townhouse she was considering in the west end. It was a sleek corner unit by Urban Capital, clad in dark grey brick and wood. Rob almost came through the line with excitement and disbelief because the house sat adjacent to his, with abutting backyards. 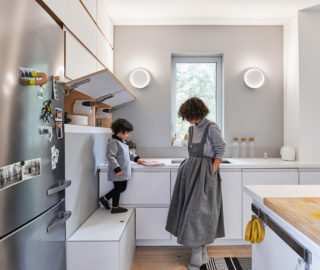 He, his wife, Daryn, and their two young children had moved into the opposite side of the modern 45-unit development that fronts onto two streets only a month prior. Over at Rob and Daryn’s, the third-storey kitchen shares space with the living room. Here, cabinetry sandwiches an island/breakfast bar. 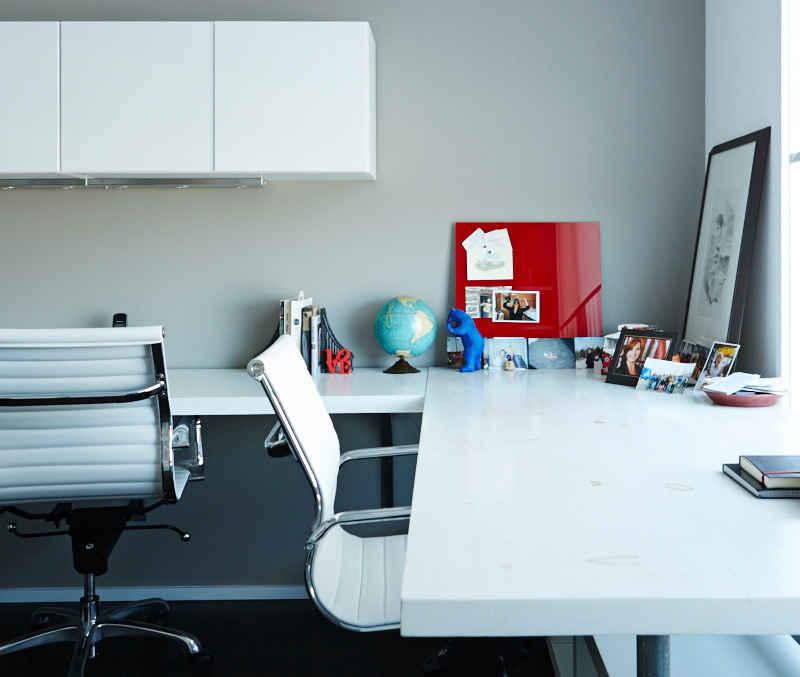 Desk from Design Within Reach; photo by James Storie; prints by Gary Taxali and the Royal Art Lodge. 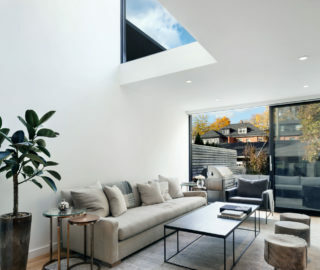 What followed is a study in contrasts: how two families took similar finishes, three storeys and a comparable amount of space, and made them their own. The Cecconi Simone–designed interiors boast plenty of marquee minimalist features – floating stairs with thick wood treads, hidden-drain sinks and showers, storage doors that open vertically or by rotation – with a blank-canvas palette of white stone and dark striated wood. 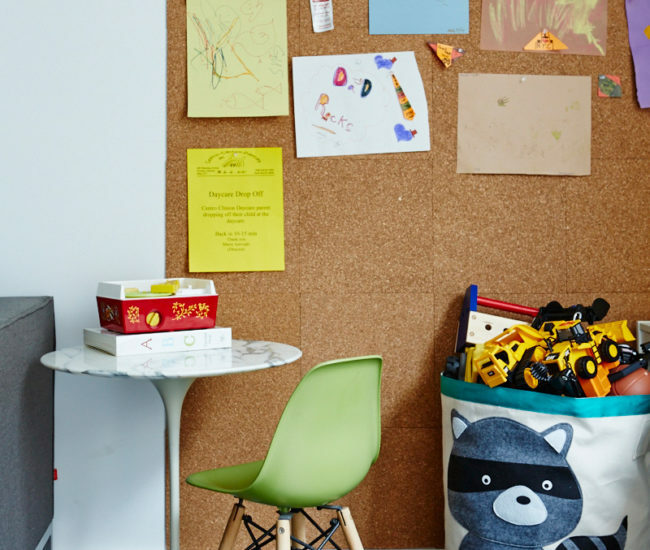 For Rob, an ad agency CEO, this was an open invitation to the colourful pieces and chaos that is family life with kids. 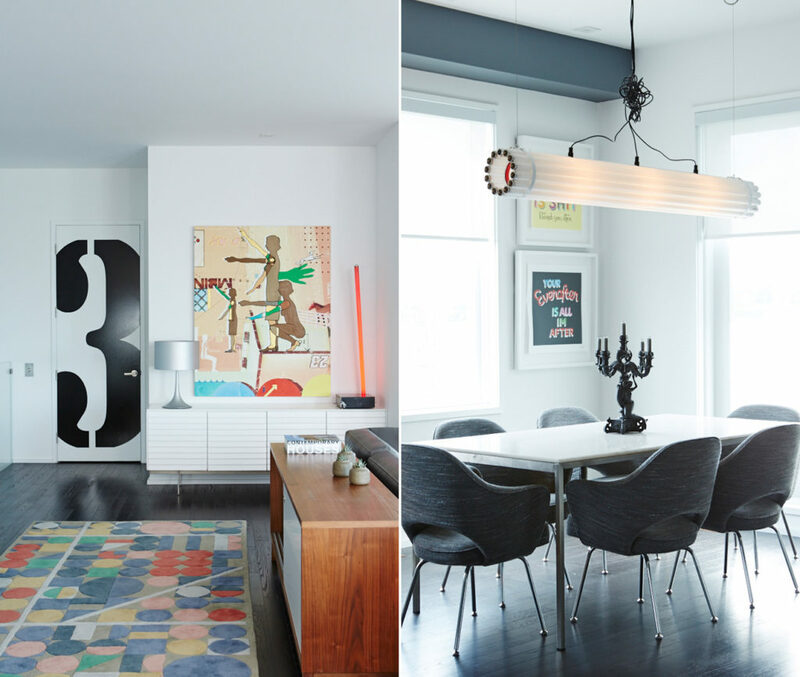 “I love a lot of art and mid-century modern furniture, splattered all over the place,” he says. The open top floor of Rob and Daryn’s reverse-oriented unit allowed them to do just that. 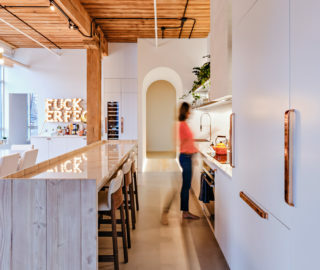 Blood-orange rugs, vibrant Robert Rauschenberg paintings and Castor fluorescent lighting adorn the combined kitchen, living and dining space. 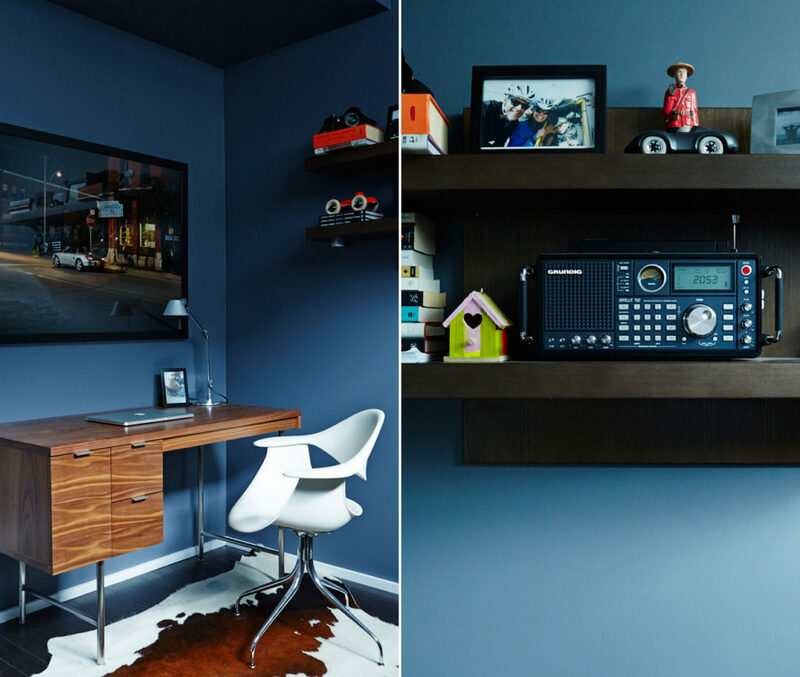 Left: Rob had the second-storey master bedroom painted the Pantone shade of blue representing his birthday. Wardrobe by California Closets; Jieldé lamps available at Hollace Cluny; bed from DWR. Right: Eames coat racks from Ella+Elliot. 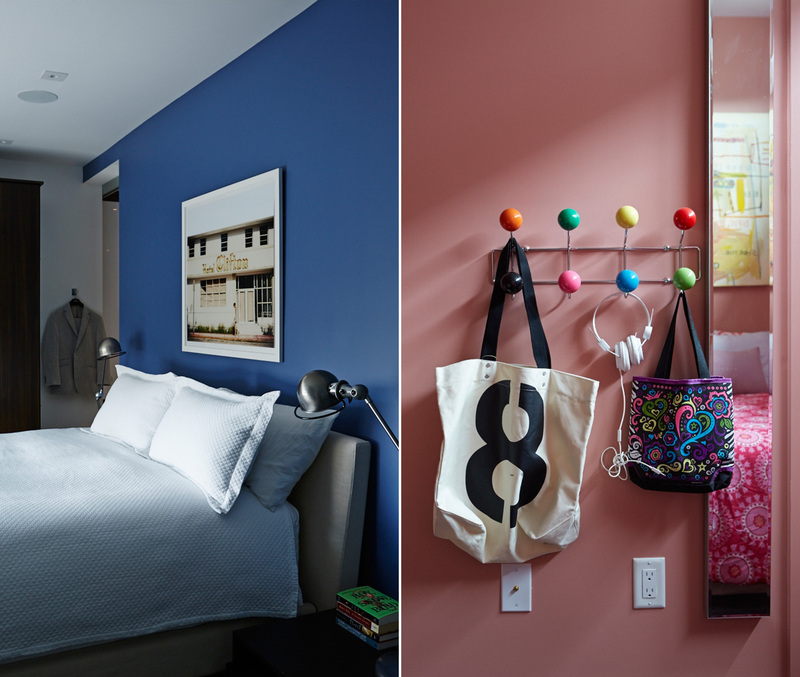 On the second floor, three bedrooms and an office are painted in Pantones matched to each family member’s birthdate. “We thought we’d stick to boutique hotelier Ian Schrager’s idea about hotels,” says Rob. 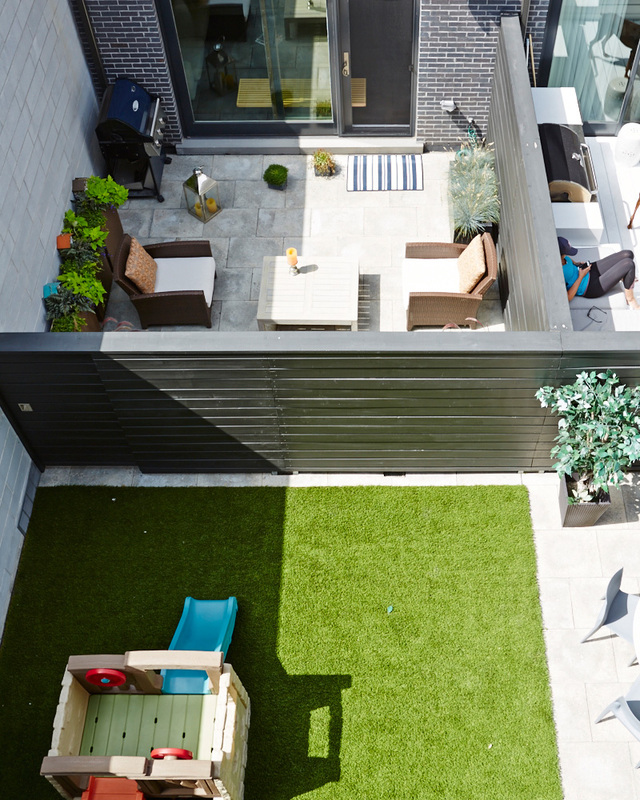 “Let’s keep the bedrooms small and the lobby, our living space, big.” The main floor is the kids’ domain: a playroom, outfitted with a custom Scavolini kitchenette, opens up to a courtyard. On the other side of the fence is a very different story. Jill and Pollie take a spin around the Caesarstone-topped kitchen island anchoring the seamless ground level. The open-tread staircase filters south-facing sunshine. Flooring by Satin Finish Hardwood; kitchen by Cartier. “We kept our space with clean lines and a minimalist aesthetic,” Jennifer says of the home she now shares with her partner, Jill, and Jill’s Labradoodle, Pollie. Their house has a bottom-to-top orientation. 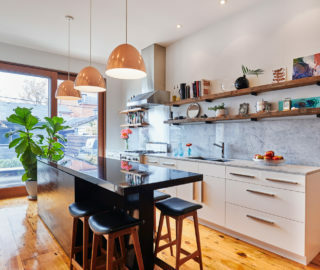 The open-concept main floor pulls in plenty of light from south- and west-facing windows, which showcase to passersby a supple yet compact layout: a recessed banquette and dining table leading to a slim galley kitchen, whose open-faced cupboards step down to living-room shelving at the back. 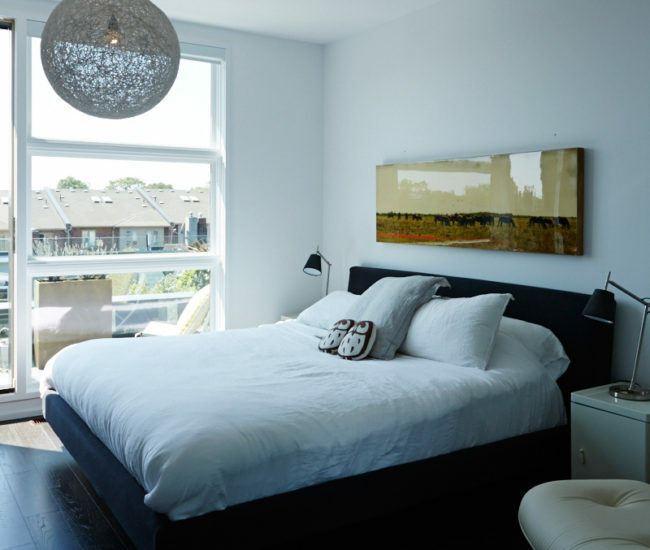 From the left side of the bed, the view from a perfectly placed southern window looks as far south as the CN Tower. Mirror from IKEA. Above, windows in the office provide a view of Toronto’s skyline. “I wanted a comfortable space,” says Jennifer. “I can come in, close the door, unplug and unwind.” The master bedroom is a third-floor getaway unto itself that boasts a spa-like bathroom; a walk-in closet; and a large, sunny bedroom with a private balcony. Throughout are nods to family history: black-and-white illustrations by Jill’s great-uncle, Canadian war artist and designer Eric Aldwinckle; and vintage furniture from a past life in Montreal. Shortly after Jennifer and Jill moved in, the couples had the wall that separates their yards customized with a sliding door that connects the outdoor spaces, taking over-the-fence conversations to a cozier level, and allowing for plenty of borrowed newspapers, party spillovers and impromptu dinners. And though the grass is certainly a different shade on either side of the fence, neither one is greener. Originally published in our Winter 2014 issue as This Way, That Way.